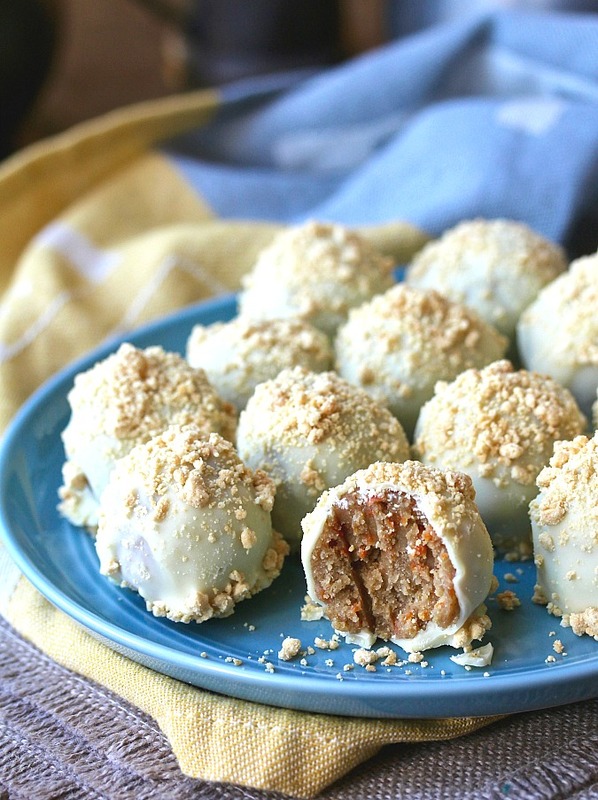 I coated these carrot cake truffle with a good quality white chocolate, and then sprinkled them with a delicious ingredient called "milk crumb." This is a mixture of milk powder, flour, cornstarch, sugar, salt, and butter, which is baked. Then, it's coated in melted white chocolate, allowed to harden, and then ground in a food processor. 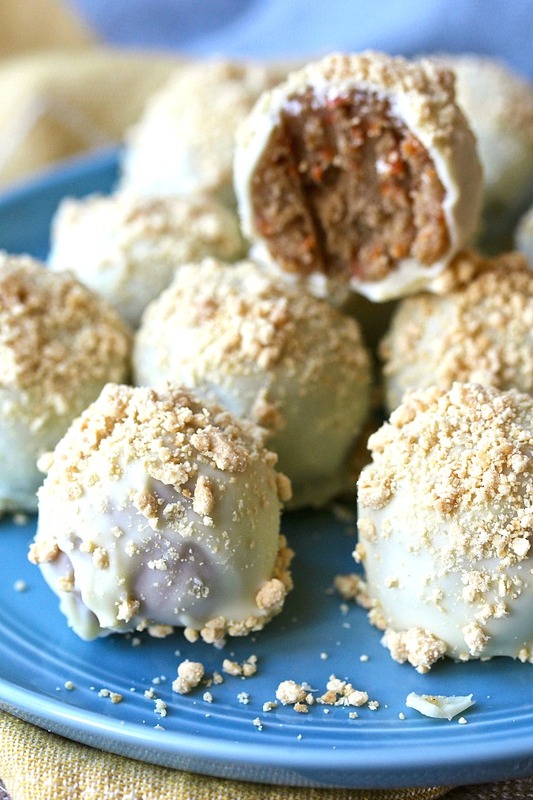 These are not cake/frosting/almond bark cake balls. These are a grown up dessert. 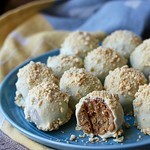 I am completely enthralled with the Momofuku Milk Bar cookbook. It's one of those cookbooks that I enjoy reading from cover to cover. I have yet to try one of the gorgeous rustic cakes (although the cake rings and acetate sheets are sitting in my Amazon shopping cart). To make the truffles, you can make it an all day project, or spread the process out over a few days. The cake will stay fresh in the refrigerator for up to five days, and the liquid cheesecake comes together easily. My suggestion is to make the cake, the liquid cheesecake, and the first phase of the milk crumb on the first day. 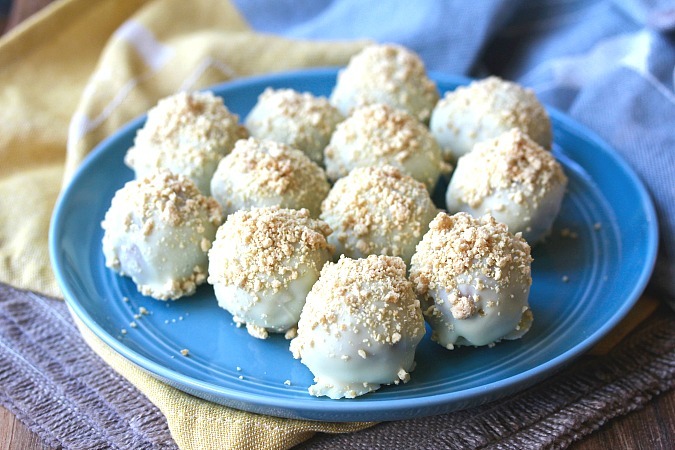 The next day, finish making the milk crumb, form the cake balls, and then coat them with the white chocolate and sprinkle them with the milk crumb. Even though this is a small cake, I had quite a bit leftover. We had no trouble using up the rest of the carrot cake. In fact, we drizzled it with the leftover liquid cheesecake. So good. I'll forgive you if you decide to skip the milk crumb. In fact, white nonpareils would be gorgeous on these. Still, I recommend making the milk crumb if you can. This recipe is for 12 truffles. If you'd like more, double the liquid cheesecake recipe, triple the amount of white chocolate for dipping, but keep the rest the same. This should be enough to use up the entire cake. One thought: Be sure to use the fresh, smallish carrots that can be purchased with their tops on them, and preferably organic. You will be rewarded with so much more carrot flavor. You can melt the white chocolate in a double boiler. I used this Wilton Pot, which worked like a charm. P.S. If you are a fan of baked goods with carrots, be sure to check out these carrot muffins and this amazing carrot bread. This month, the Fantastical Food Fight is all about carrot cake. After the recipe, be sure to check out the rest of the carrot cake themed recipes. Heat the oven to 350 degrees F. Line a quarter sheet pan with parchment, and spray with spray oil. In the bowl of a stand mixer, add the butter and sugars and cream with the paddle attachment on medium high for about 3 minutes. Add the eggs, and mix for another 3 minutes. Switch to low speed and stream in the oil. Once the oil has been incorporated, increase the speed, and mix on medium high for about 6 minutes. Scrape down the sides of he bowl as needed. Switch to a low speed, and slowly add the flour, baking powder, baking soda, cinnamon, and salt. Mix for about a minute, until everything is combined. With a spatula, add the freshly grated carrots and mix until incorporated. Spread the batter over a parchment lined quarter sheet pan and bake for 25 to 30 minutes. Cool on a wire rack in the pan. Whip the cream cheese in the bowl of a stand mixer. Add the rest of the ingredients and whisk until everything is incorporated and smooth. Pour the ingredients into a custard cup. Place the cup into the oven and bake for 15 to 20 minutes. Cover with foil and let set at room temperature for about an hour. Store in the refrigerator for up to a week. Combine the 20 grams milk powder, flour, cornstarch, sugar, and salt in a medium bowl. Mix with your hands. Add the melted butter and and mix until you have a crumbly mixture. 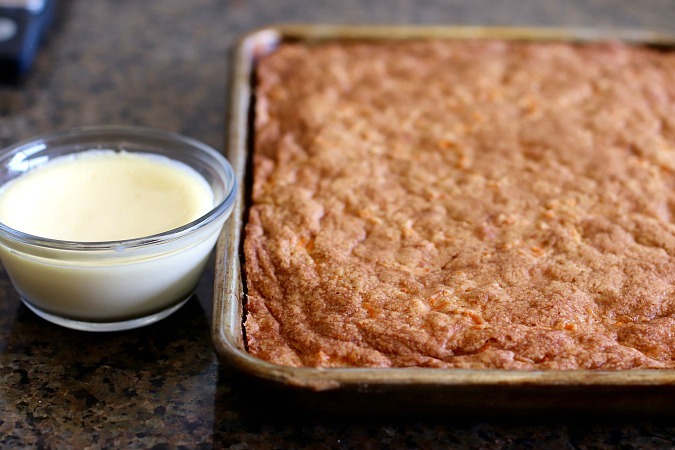 Spread the mixture over a parchment lined baking sheet, and bake for about 20 minutes. Cool completely. Add the melted white chocolate to the mixture and toss with forks every 5 minutes until crumbly. Refrigerate until hardened. Process in a food processor until finely ground. Combine the carrot cake crumbles with 25 grams of the liquid cheesecake in the bowl of a stand mixer, and mix with the paddle attachment. Add more cheesecake until the mixture is is moist enough to form a ball. Divide the dough into 12 equal parts and form each part into a ball. Refrigerate or freeze. Melt the white chocolate and spread the Milk Crumbs over a shallow bowl. Dip each cake ball into the melted chocolate, tap off any excess, place the coated ball on wax paper, and sprinkle with the milk crumb. Repeat with the rest of the cake balls. Refrigerate until ready to serve. Ha ha. So many cookbooks, right? There's a lot of wonderfully unique recipes in there. Yum! These would be dangerous around me! Thanks Lynda! I had to take them to work to get them out of my house! Wow! I'm intrigued. I might have to get my hands on that book. I can see you doing amazingly well with the recipes. Oh yum! These look amazing and very creative. I was curious about the name of these truffles. Now I want to take a gander at that cookbook. Thanks Wendy. She has some spectacular desserts, especially cakes. I think you'd enjoy it a lot. Carrot cake you can just pop in your mouth!! YES PLEASE!! Lol. I'm a total cookbook fan! So I basically agree with all the previous comments - I need the cookbook, carrot cake that you can pop in your mouth would TOTALLY be dangerous around me, and WOW! Those are stunning! Cookbook recipes are so different from the ones we find on the internet. Delicious looking truffles Karen. I'm so intrigued by the milk crumb recipe. 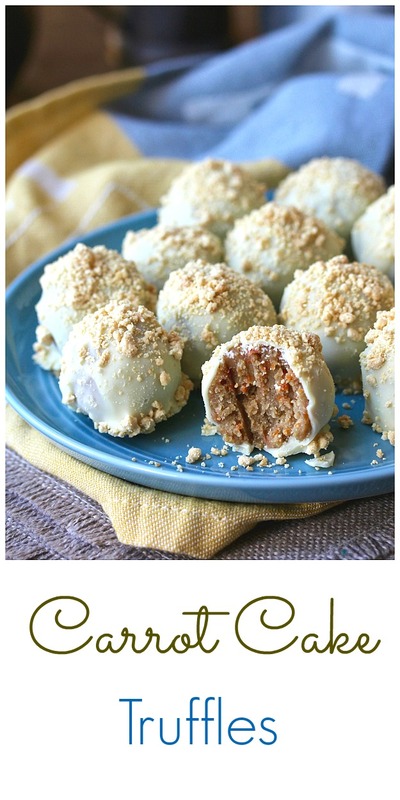 Carrot cake + truffles?? = love! Thanks for sharing at our Cupcake & cake party for Celebrate365 Blog Party!